As diverse as its supply, Petrosul markets sulphur into both the North American and offshore markets, primarily to the fertilizer sector but increasingly to the mining and industrial chemical sectors. Petrosul actively pursues new markets for its suppliers’ sulphur wherever global consumption trends dictate. Petrosul enjoys strong relationships/affiliations with a number of leading commodities trading companies in developing and expanding its global long term business on a partnership, collaborative basis. 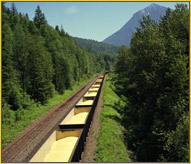 Petrosul provides sulphur handling, forming, and transport of both molten and solid sulphur. Through our affiliation with Heartland Sulphur Terminal, we provide sulphur forming services directly to oilsands area producers. Petrosul negotiates transparent product exchanges to reduce cost and increase efficiencies in the market; as well as negotiating competitive trucking, rail and forming agreements through affiliations and partnerships in the industry. Petrosul’s contract with Pacific Northwest Ship & Cargo Services provides competitive ocean freight options and supervised loading of vessels. 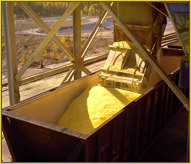 Petrosul has the capability to ship one tonne bags of sulphur to consumers in North America and worldwide. Petrosul also markets plant nutrient sulphur and micro nutrients internationally. SGS and Certispec carry out required sampling and analysis at vessel loading. Through key contacts with Canadian and International banks, Petrosul can assist customers with obtaining competitive trade financing.